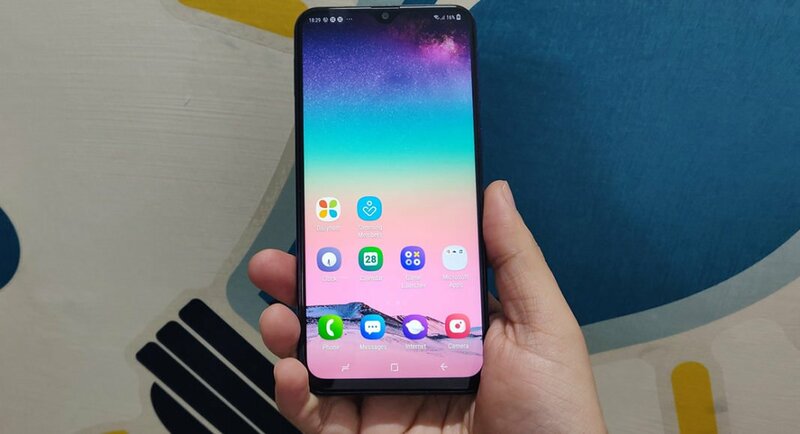 Samsung has been experimenting with the design and performance of its entry level smartphones since some time now and the outcome is the launch of Samsung Galaxy M20 and M10 smartphones. The Galaxy M20 smartphone is built for the youth and is an India first innovation. This one has a massive 5,000 mAh battery inside and comes with an Exynos 7904 Octa core CPU with 1.8GHz clock speed. We spent some time with the latest smartphone by Samsung (the 4GB RAM + 64GB storage version) and here are our first impressions of the neat little device. Let’s talk about its design first. The Samsung Galaxy M20 is not the usual lightweight boxer you find in the budget segment, instead it is a heavyweight thanks to the mammoth 5,000 mAh battery inside. The front of the smartphone is dominated by a large 6.3-inch FHD+ infinity-V display. This is the first smartphone by Samsung that comes with a waterdrop notch design, which has the front facing camera on it. With the ear speaker right above it on the top edge. Since it is Samsung’s first waterdrop design innovation under the Made for India initiative, we have to say we are a bit impressed that Samsung has kept such a slim chin area. When we compare it to others in the market like Xiaomi or Oppo, some of their phones in this price bracket still have a large chin band. But not this one. Moving on, the screen is protected by toughened glass which is a bit raised and comes a few millimeters out of its casing. Nevertheless, this smartphone is comfortable to hold. The case is derived from a single mold of plastic and there no sharp or jagged edges on this smartphone. The right side of the mobile has the volume rocker key with the power button right under it. The left side has the SIM tray. Talking about which, this one can place 2 nano SIM cards inside as well as a microSD card of up to 512GB. At the bottom Samsung has placed a mono loudspeaker, USB type C charging port and 3.5mm audio jack. On the top you get the secondary pin hole microphone. Flip the device around and you will see the dual vertically stacked cameras with a LED flash under it, next to it is the larger than usual finger print scanner, with the Samsung branding below it. Also, if you look closely at the bottom part of the case you will find that it reads manufactured in India, which is quite cool to recite. We played quite a few YouTube videos on the Samsung Galaxy M20 and we were not one bit disappointed. The colours are vibrant and the text is crisp. The sunlight legibility is also quite good. The 13-megapixel primary camera at the back has an aperture size of 1.9 and the secondary 5-megapixel sensor there has an aperture size of 2.2. The front 8MP sensor has an aperture size of 2.0. These are great for photos and we will show some of the shots the rear one can take in just about a second. Videos can be recorded in Full HD and not 4k, on both the front and rear cams. Maybe in the next software update that will be available too. We found the cameras to take crisp pictures with very close to life colours. Our initial tests do suggest that this smartphone can very well be the king in the budget segment when it comes to smart photography. This smartphone has Android 8.1 Oreo running on it and not the Pie. There might be a software update coming soon, but no official word has been given. The user interface is very Samsung and at the time of its first boot the device did ask us which apps to additionally install on the device. This is great as you can reduce the bloatware and can keep only those apps which you want on it. But you will still find some additional apps lurking on it. Thankfully these can be quickly uninstalled, in case you don’t want them. Overall, at the moment the operating system is slick, we are not facing any sort of lag during operation, and things are loading quite swiftly. The cameras are working well and the large battery is lasting for more than a day, even after heavy usage. The loudspeaker is pretty loud and we tested the Dolby Atmos sound with a pair of headphones, it does make a difference. 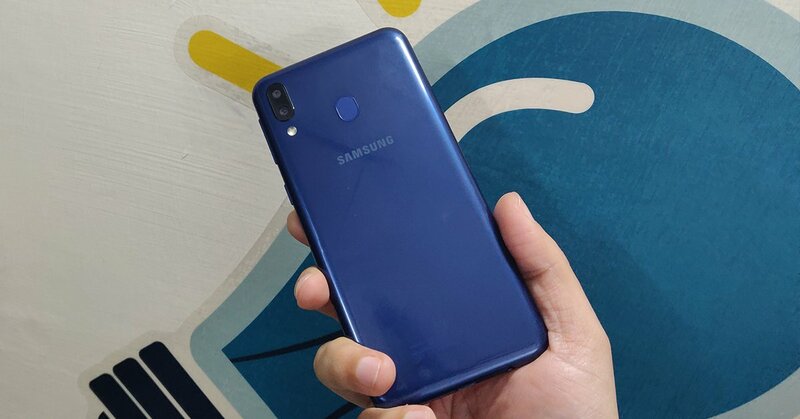 The younger brother Samsung Galaxy M10 has also been launched with this smartphone, so together they provide a lot of choice to the user.